Cheese. Who doesn’t love cheese? It comes in many varieties and is fabulous on its own, or with crackers or bread. More importantly it’s the basis of so many different comfort foods. Macaroni Cheese, Cheese on toast, Grilled cheese sandwiches, Cheeseburgers, Pizza! The problem with all of these delicious comfort foods is that they all involve melting the cheese. So why is that a problem? Good question, I was hoping you were going to ask that. Well, cheese is basically a mixture of fat and protein solids (together with a little acid and salt). When you heat most cheeses, first the fat melts, causing the cheese to become soft and flexible, and then as the heat increases, the proteins that are holding the globules of fat in place start to break down and the cheese melts. Delicious though melted cheese is, the leaching of the molten fat is not only messy, it allows valuable flavours to dribble away and get lost. 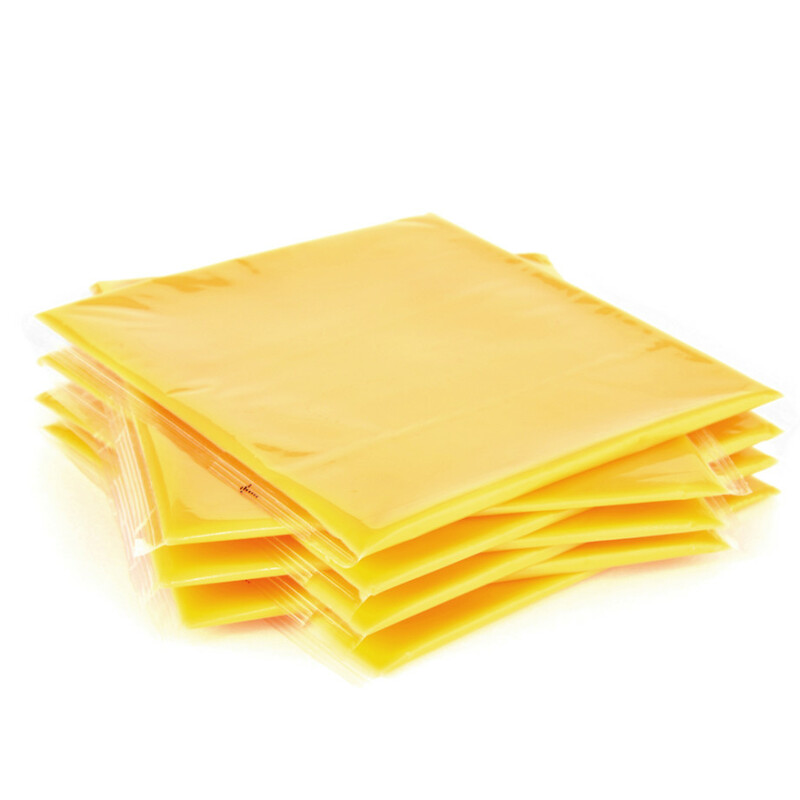 The fat then lubricates whatever the cheese is sitting on and the melted proteins start to simply slither away. It’s all very tasty, but messy and awkward. If you’ve ever tried making your own cheeseburger and melted slices of cheddar on the top, you’ll have seen all this happen. Fast food burger joints avoid this by using slices of processed cheese. They don’t have the same depth of flavour of, say, a good mature cheddar, but they do have the structural integrity that is essential in holding a cheeseburger or a grilled sandwich together. Now, wouldn’t it be great if we could make our own processed cheese, but instead of that bland pale yellow stuff that you get in the supermarket, we could use a delicious Montgomery Cheddar, or a nice, nutty Gruyère? We’d have all of the flavour, and the texture that we need. Mmm. Well, it turns out that we can. What we need to do is to add something that will prevent the fat and the protein solids from separating. When solid, cheese is actually an emulsion – it consists of tiny drops of fat suspended in water, all held together by a network of proteins. When heated, the protein network breaks down and the fat and water are released. Now, as we all know, fat and water aren’t the best of friends and so they tend to go off and do their own thing. If we add an emulsifying agent, it can prevent the fat/water emulsion from separating and help hold everything together into a homogenous mass. There are a number of emulsifying agents we can use, but the most common is sodium citrate. Sodium citrate is a salt of citric acid and occurs naturally in many foodstuffs. It’s readily available on the internet, but you only need a tiny amount in most recipes, so a large tub will last for a very long time. Take some liquid. Beer is good, or milk, or stock, or even just water if you like. Grate your favourite cheese and add a little at a time, whisking as you go. (Lots of recipes say to use an immersion blender for this, but I find a balloon whisk works just fine). Alternatively, pour into a small, deep tin to make a solid block and cut into slices once cooled. Note that if using a mature cheese, you should add portion of a younger cheese too – mature cheeses have less water in them, so mixing some younger cheese in with it helps keep the water/oil ratio high enough. Once you have your cheese slices, use them on burgers, toast, or whatever takes your fancy. Once you’ve mastered that, it’s easy to come up with variations. Changing the ratio of liquid to cheese will change the overall texture of the result – you can make anything from a solid block to a pourable sauce. For example, I’ve found that a mixture of Gruyère and Emmental, with a slightly increased amount of liquid, makes a delicious spreadable cheese, not unlike Dairylea. There’s a useful calculator to help work out the numbers over at Modernist Cuisine. (Be patient, the page takes an age to load – it embeds some weird Excel plugin or something). Challenge Anya is all about getting Anya to make things that she would otherwise never try. This, I think, falls easily under that remit. So, Anya, your challenge is to do some interesting things with cheese. It’s awkward to buy sodium citrate in small amounts, so I’ll pop a small sample in the post for you – if you get hooked on the idea though, you’ll need to buy your own tub. Small amounts are tricky to weigh out, you really need some proper scales like these. You can approximate, but the results will likely vary a bit more, but I’ll give you a little help. I’ve done some weighings, and the citrate I’m posting (Ferran Adrià’s Texturas brand) comes in at 5.89 grammes per level teaspoon. Make cheese slices, using the cheese(s) of your choice. For bonus points, also make macaroni cheese. This sounds like an interesting challenge, and it can be done with naturally occurring ingredients. That bit surprises me. As Dave said, this is the best cheese sauce ever! Warning; it is very rich. I have sluggish digestion. A massive amount of cauliflower cheese nearly finished me off the other week. But I’ve learned that next time I must eat less sauce. I used to think processed cheese was bad stuff. And some commercial processed cheese probably is, but this is really good to eat and so simple that in no way, apart from it’s richness, is this a bad food.